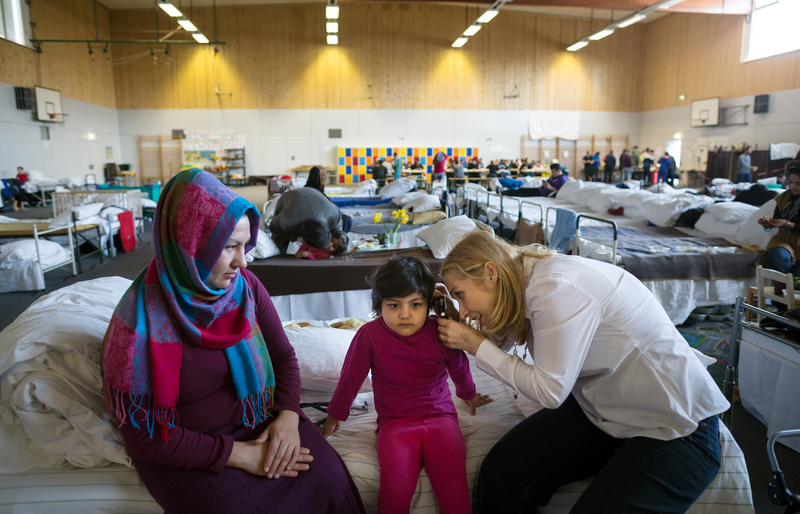 As thousands of refugees streamed into Berlin, they strained the health care system. Rotarian and physician Pia Skarabis-Querfeld spent the last three years building a network of volunteer doctors to help those in need. On the nightly news and around her city, Pia Skarabis-Querfeld saw the refugees arriving in Berlin after fleeing war, persecution, and poverty in their home countries. Wanting to help, she gathered a bag of clothes to donate and headed to a nearby gym filled with refugees. What began as a single act of charity eventually evolved into an all-encompassing volunteer project: Over the next three years, Skarabis-Querfeld would build and run a network that, at peak times, would include more than 100 volunteers helping thousands of refugees at community centers, tent camps, and other shelters across the city. Today, her nonprofit, Medizin Hilft (Medicine Helps), continues to treat patients with nowhere else to turn. That day she went to the gym was a few days before Christmas 2014. Skarabis-Querfeld had been busy with work and preparing for the holidays. She was looking forward to a much-needed break, and she thought clothes for the refugees would be a kind gesture befitting the spirit of the season. When she arrived at the gymnasium to drop off her donation, Skarabis-Querfeld found sick children, most of them untreated because hospitals in the area were overrun. Helpers were not allowed to give out pain relievers or cough syrup due to legal constraints. All they could do was send people to the emergency room if they looked extremely ill. Seeing this, and knowing about the treacherous journeys the refugees had just made across land and sea, Skarabis-Querfeld, who is a medical doctor and Rotarian, returned that same afternoon with medical supplies and her husband, Uwe Querfeld, who is a professor of pediatrics and a Rotarian. The couple spent most of that holiday treating patients in the gymnasium. “The suffering of the people, their bitter fate, it wouldn’t let go of me,” says Skarabis-Querfeld. In 2015, the German ministry in charge of refugees received more than 1 million applications for asylum, straining the public health system. Germany was a popular destination during the mass migration of people from Syria and other countries with conflict, in part because Chancellor Angela Merkel embraced them. Unlike some other European leaders, Merkel said it was Germany’s responsibility to help, and she called on citizens to welcome those escaping hardship elsewhere. By 2017, the political winds had changed. Many Germans had become indifferent to or skeptical about the immigrants. The balance of power in Germany’s parliament shifted during the September election, and the country continues to grapple with the logistics and cost of helping refugees and their families. While the politics played out at the famed Riechstag building in the heart of Berlin, Skarabis-Querfeld and other volunteers were treating patients only a few kilometers away. In another case, Skarabis-Querfeld treated a Syrian girl named Saida who had fever and bronchitis. When the examination was almost over, Skarabis-Querfeld noticed Saida was limping. She coaxed Saida to take off her shoes and saw both feet were infected. “I had seen a lot of children with small shoes on. Some had probably started walking in those shoes and worn them for one year,” Skarabis-Querfeld says. After she treated Saida with antibiotics, the girl from the war-torn country took an interest in helping at the clinic when the doctor was in. She would wait at the door half an hour before Skarabis-Querfeld arrived and delight in taking on small tasks, such as making copies. In the weeks after Skarabis-Querfeld started treating patients in makeshift clinics, volunteers from every discipline began to show up looking to help the tens of thousands of refugees arriving in Berlin. Dr. Pia Skarbis-Querfeld's Medizin Hilft project received the 2017 Berlin Health Prize for its care of refugees. During the peak of the 2015 refugee influx, Medizin Hilft had more than 100 volunteers, and she was receiving dozens of emails a day with offers of help. In addition to providing immediate care, the nonprofit conducted immunization campaigns and helped immigrants navigate the German health care system. The Rotary Club of Berlin-Nordwas quick to support Skarabis-Querfeld’s nonprofit. National media took notice of her efforts. She estimated she was volunteering 20 hours a week in addition to working her regular job. Other Rotary clubs, including Rotary Club of Berlin-Tiergarten, joined the effort. “I had moments when I thought, ‘I’m going to throw it all away, and then I’ll get my life back.’ But then my sense of responsibility kicked in again for this project that has grown so much and grown together,” she says. A steady stream of patients is treated at open.med, a clinic funded by Medizin Hilft in the Zehlendorf neighborhood of southwest Berlin. On a weekday in September, a Ghanaian woman named Anita visited the clinic, which consists of a few rented rooms in a naturally lit basement. Anita, a refugee, had come for pain and bleeding in her uterus, and the clinic was the only place she could turn to. Anita lives under the radar in Berlin: unregistered, uninsured, and unable to pay for basic care. She has little chance of staying in Germany legally because Ghana is not on the government list of extremely dangerous countries. Anita is among the roughly 15 percent of clinic patients who are either unregistered or homeless, says Dorothea Herlemann, the open.med project coordinator. Many patients are refugees living in temporary homes who have difficult medical problems, have not yet learned the German health care system, have no language support, or cannot find a doctor who will see them. Some have temporarily lost access to the health care system, usually because of paperwork problems. “For us, it’s not important whether a refugee is registered or not. These are people who need help, and we help them. We also conduct information campaigns in their languages to help refugees learn how to use the regular health system. We are not trying to build up a parallel medical system here,” says Herlemann, whose staff position is made possible through a grant from Rotary. Medizin Hilft works alongside Doctors of the World and other groups in refugee container villages. At one such village in Ostpreussendamm in southwest Berlin, Medizin Hilft doctors see patients once a week. Meanwhile, other volunteers provide general support, helping residents to manage paperwork and begin building a life. The 280 residents at the Ostpreussendamm village come from Syria, Afghanistan, Iran, Iraq, Eritrea, Somalia, Cameroun, Russia, and Togo. Many of them, including children, remain traumatized by what they experienced before fleeing to Germany. Twenty-six-year-old Khalat Saleh is from Iraq’s Kurdistan region and uses a wheelchair. Wearing a black sweatshirt that says “Break the rules,” Saleh gives a friendly smile as he finishes a German language lesson conducted by volunteers. In broken German, Saleh, who has been granted political asylum, explains his daily struggle to wash and eat independently. Saleh has seen the Medizin Hilft volunteer doctors numerous times, and volunteers help him receive the care he needs. He hopes to eventually work with computers. Karmen Ishaque is a 31-year-old Iraqi who fled religious persecution and has been approved to stay in Germany for three years. She was treated by Dr. Barbara Grube of the open.med clinic for high blood pressure and borderline diabetes. Ishaque lived in a camp in Zehlendorf for just a few months until she got her own room. It was a big step for Ishaque, who has been officially recognized as a refugee. She arrived in Germany at the beginning of 2015 and says she could imagine making her life here. She plans to get training to work as a kindergarten teacher. “I would like to marry, have kids, have a job,” she says. Not every person who seeks refuge or a new life in Germany will get their affairs sorted as fast as Ishaque or have a real chance at integration. Many are being deported or asked to leave voluntarily. For Medizin Hilft, times have changed as well. “It’s much harder to attract volunteers now. On one hand, the political atmosphere changed, and on the other, news about refugees is not so front-and-center anymore,” said Dr. Laura Hatzler, who helps run the open.med clinic. For Hatzler, who was also part of the network from the beginning, helping Skarabis-Querfeld during those first days in the gymnasium, the work of Medizin Hilft is not finished, even if support and interest has dwindled. What keeps Hatzler going is the joy of taking action for something she believes in. “If you really have an idea in your mind, and you really want it, and you connect with people who have the same ideas or similar, you can really move something,” she says. A Rotary global grant of $160,000 will make it possible for Medizin Hilft to run the open.med clinic and the information campaigns until March 2018. As Skarabis-Querfeld thinks about the ups and downs of the last three years, she worries about funding moving forward. She is also concerned about Germany’s massive task of integrating hundreds of thousands of immigrants into society and the economy. Town in Nova Scotia embraces Syrian refugees. Ready story. Rotarians Dr. Pia Skarbis-Querfeld and Professor Wilhelm Buerklin visit the Zehlendorf refugee camp. A Rotary global grant of $160,000 is making it possible for Medizin Hilft to run the open.med clinic. Lead pharmacist, Sabine Weyermann, and nurse, Jens Peter Schmidt, sort the medicine that has been delivered to the clinic. Assistant coordinator of Medizin Hilft, Burcu Guvenc, left, discusses the day’s schedule with project coordinator Dorothea Herlemann and Dr. Pia Skarabis-Querfeld. Burcu Guvens, left, and Dorothea Herlemann, volunteer coordinators of Medizin Hilft, discuss the schedule of the volunteers and patients. Nurse Jens Peter Schmidt, nurse, prepares to visit refugees at the Zehlendorf refugee camp.